It has been a tradition of my family in Penang to cook Bubur Cha Cha as part of the celebration of the last day of Chinese New Year also known as "Chap Goh Meh". I do not know the real reason. I think maybe the idea is to end the Chinese New Year celebrations with something rich and sweet. For this year's Chap Goh Meh, I thought I would prepare something a little different and less fattening. I substituted the coconut milk with soy milk. It may seem weird at first but Soybean Bubur Cha Cha actually tastes really good. It may look like Bubur Cha Cha but it isn't. It is really a soybean milk dessert. A good friend of ours thought it should be called Soya Cha Cha and the name stuck. So, this is Soya Cha Cha... I hope you'll enjoy this recipe as much as we have. Enjoy! Place the flour in a mixing bowl and slowly add boiling water. Mix with a wooden spoon to form a dough, then add in the pandan juice and mix until well incorporated. When the dough is cool enough to handle, roll it out evenly on a well-floured surface and cut into desired shapes. Bring a pot of water to boil, then drop in the cut tapioca flour dough. Boil until the dough is translucent and the pieces rise to the surface, scoop out and throw into ice water to stop the cooking (do not over boil as the jelly will become soggy). Keep them in the water until required. Drain first before using. Peel, wash, cut sweet Potatoes and yam into cubes or your desired shapes. Steam separately until tender for about 10 - 15 minutes. (Please do not over steamed, otherwise they will turn out really soft and mashed). In a pot, boil black-eye beans in enough water to cover until soft under low fire. It takes about 30 minutes. 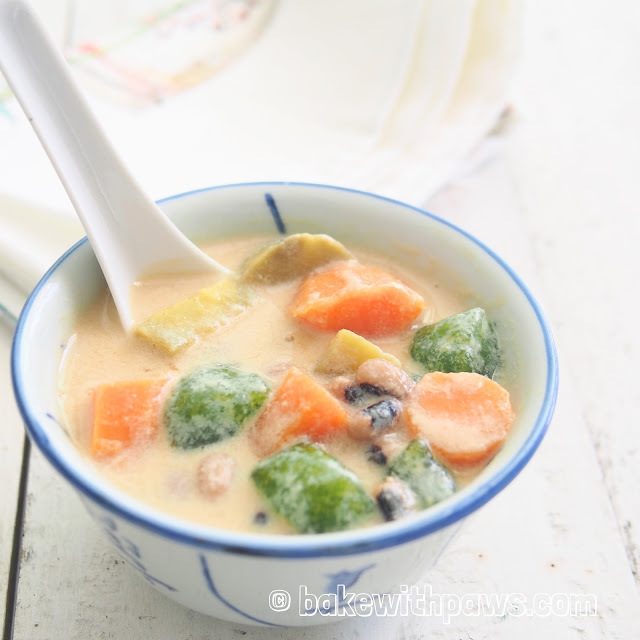 In a pot, add in homemade soybean milk (you may heat up the soybean milk if you prefer hot. But, please do not bring to boil as it may become thicken). Put steamed sweet potatoes, taro, black-eye beans and tapioca flour jelly into the soybean milk. Stir to mix well. Please add more sugar in the soybean milk to adjust to your preference for sweetness.